Hope everyone had a great weekend! We had a big party here yesterday, packed with a ton of kids. And you know that in addition to outdoor summer fun, dessert is high up on their list of favorites as well. Most people know about dirt, but not many are familiar with sand. It’s basically the vanilla version of dirt, and equally as delicious! Since I didn’t have a clean pail and shovel, I had to improvise with a Yankees bucket we got at one of the games. 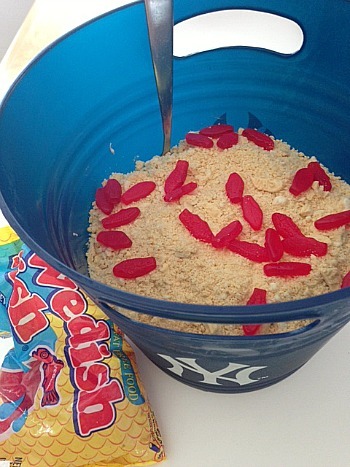 It worked out since the majority of the people who were here are fans 🙂 Top it off with some Swedish fish and you’ve got yourself a delicious summer dessert! 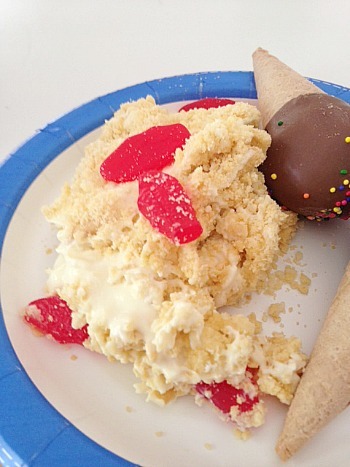 And check out those adorable ice cream cone cake pops that my friend Lisa made…another big hit with the kids! Grind cookies in food processor. Cream butter, sugar, cream cheese and vanilla in mixer until smooth. In a large bowl, mix pudding and milk together, adding milk slowly to avoid lumps. Fold in whipped topping. Stir into cream cheese mixture and combine until smooth. Layer in a clean bucket, starting with cookies and alternating with pudding mixture, ending with cookies on top. Refrigerate for at least 3 hours before serving. Top with Swedish fish. 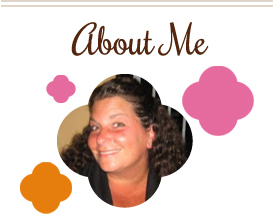 This entry was posted in cookies, cream cheese, dessert, make ahead, QuickAndEasy. Bookmark the permalink. Creative idea! I would love it if you joined and contribute your awesome posts at my link party at City of Creative Dreams, starts on Fridays 😀 Hope to see you there at City of Creative Dreams Link Party.